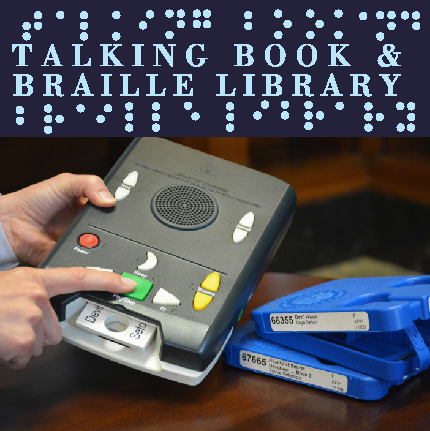 Did you know that Talking Books provides free library service to any resident of Indiana who cannot use standard printed materials due to a physical or visual disability? No? Chances are thousands of eligible Hoosiers do not know about this free service either and you are often the best method of spreading the word. If you work in a library, you can help by making sure patrons who read large print or listen to audio books know that there are additional materials they can receive from the Indiana State Library. It can be through something as simple as placing some talking book brochures by these collections, or assisting a patron in ordering a book we have that you might not have in your collection. We have over 20,000 large print books and 60,000 audio books (all audio books are also available to download) that we are eager to share. Your library can also borrow materials to loan to your patrons or to use as demonstration to show what a “Talking Book” is. We are happy to loan your library a rotating collection of large print materials that can be loaned to your patrons. After a few months, return the books and we will send you a fresh supply of books to loan. Your library can also borrow a digital talking book player that can be used to show patrons who may find the idea of digital books a scary prospect, just how easy it is. Demonstration BARD (the website were all of our audio books can be downloaded from) accounts are also available for libraries to assist patrons in downloading their own books. Our shelves are stocked with promotional materials that we are always happy share. We have applications, brochures, magnets, pens, braille book marks, informational “fact sheets”, posters, and other items that we can send you. We want to be a resource to help you provide exceptional service to all people. Here are some resources to help you spread the word about Talking Books and to help you provide the best service possible to your visually and physically disabled patrons. For further information, please contact us at tbbl@library.in.gov. This entry was posted in Talking Books & Braille by indianastatelibrary. Bookmark the permalink.